Sometimes, Mac users may encounter a black screen when they wake their Mac from a sleep state. 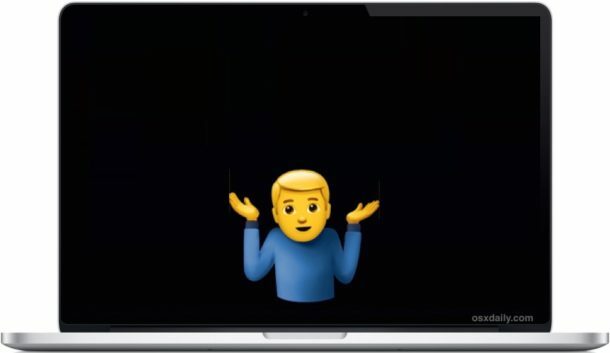 The issue is quite obvious if you experience it; when you attempt to wake a Mac from sleep or open your MacBook lid, the screen stays black, although the computer is obviously awake as often indicated by the keyboard being lit up or even alert sounds triggering from the computer. This black screen upon sleep wake issue can happen at random, I encountered the black screen on wake issue after updating my MacBook Pro to the latest version of MacOS, so although it’s not particularly common it’s also not exceedingly rare. Don’t panic! If you experience an unresponsive black screen when waking your Mac from sleep, you’ll likely be able to resolve the problem with the following troubleshooting steps. We’ve broken down this troubleshooting guide into sections from the easiest and most obvious solutions to the more complicated, follow along as needed. Often the brightness is just turned down low or the computer is actually off and not in sleep mode. Simply turning the brightness up or turning the Mac on will resolve those type of issues quickly. Sometimes just rebooting the Mac will be sufficient to remedy the issue completely, this is often the case if you encounter the black screen on wake after updating Mac system software. If the Mac repeatedly gets stuck on a black screen when waking from sleep, you should reset the onboard power management and NVRAM. For other Macs you can read how to reset SMC on Macs here, and how to reset NVRAM / PRAM on Macs here. Resetting SMC and NVRAM is a common troubleshooting trick for many odd power and display issues, and similar to the black screen on wake it will also fix most occurrences when a Mac boots to a black screen and is unresponsive on system start too. If you reset SMC, NVRAM, turned up the brightness, and insured the computer is connected and powered on, yet the Mac still wakes to a black screen continuously, you may need to reinstall MacOS Sierra (or whatever version is on the Mac). You can reinstall Mac OS without formatting the computer though it’s always a good idea to backup first. If you have done all of the above and the Mac is still getting stuck on a black screen when waking from sleep, it’s time to call the official Apple Support line or bring your Mac to an Apple Store for service. Although rare, it’s possible that a hardware issue is the cause of the problem, or perhaps some other issue that has been overlooked is causing the problem. Remember to always contact an official Apple Support channel via Apple.com, or authorized support or repair center for best results. Did this resolve your black screen on wake issues for your Mac? Let us know what helped or what didn’t in the comments below, and if you have another solution then share that too! I too have experienced this before throughout the years with MacBook Pro, often just closing the lid and waiting about 30 seconds or a minute then opening it again fixes it for me. I think what that does is force the Mac into a sleep state to create a new sleep image, then wakes it up again, and all is usually well. Rebooting and the SMC/NVRAM reset also remedy the issue but I think it’s the task of rebooting or re-sleeping and re-waking that actually solve the problem. Like you, I seem to encounter this after or soon after updating system software. I would venture to guess that the sleep image cache gets distorted and basically the solution is to make the Mac generate a new sleep image cache, but that’s just my best guess. Check software as well, if rebooting into safe mode fixes it then it’s some running software. I have been experiencing lockups that require SMC resets. I took my 2015 Air to the Apple store today. I told the “Genius” that I had the HDMI cable connected but the TV off when it happened most recently and he said that would not be the cause. I suspect that you, and not he, are correct. How did you know? I had a black screen, for the first time ever, this morning when I woke my MacBook Pro. It was before reading this article! A forced reboot resolved it. No idea what caused it. If you just updated macOS that’s probably it, happened to me too. Open the lid, keyboard lights up, caps lock will go on and off, screen remains unlit. This started happening to me when I switched from using an Nvidia-based vpu MacBook to an Intel-based vpu Macbook Air sometime around 10.10. I’ve personally filed at least 10 bugs including sysdiagnose data collected by SSH-ing into the machine after the video has crashed. I honestly don’t think Apple give a hoot or they would’ve made some effort to solve it. 9) At the “Attached files” delete the files there and drag your Video-Wake-Crash_(date/time) file and drop it in the attachment section, click Continue and submit. Doug, simplest solution is to leave it open all the time. That’s the solution I use with my iMac for last 5 years. How do you close an iMac? Hi John, I just want to know how long have you been leaving your Mac on? I am trying to fix the problem by letting it on for a while now, however, I always worry that I am over stressing my mac. I find that if I wait (anything from 5 – 20 seconds) it comes on automatically. Maybe some are too impatient? On the very few occasions that it doesn’t, than I tap the ON power button very briefly. I also noted a few times that when it came on that my Mac was doing an automatic backup, and so maybe that is one of the causes. I tried all the suggested remedies with no success. Try hitting the enter/return button. My MBP does this more often than I’d like but not frequently. I’ve found hitting the enter/return button will finally wake it. My one year old, 13″ w/Retina MBP does this more often than I’d like but not frequently. I’ve found hitting the enter/return button will finally wake it. It seems to be more likely to happen if the charger isn’t attached when I wake it. Perhaps those who’ve suggested reseting the Energy Saver preferences are on to something. I also confess I don’t reboot it very often. I tried resetting the pram, using the stated procedure. It immediately booted normally….and I got a million “PR” in the Password field. No idea what I did wrong. Maybe I’ll try it next time I reboot. The simplest solution is… don’t buy a Mac. Let’s face it, in 2017 things like this should be the thing of the past. The last time I had so many issues with Windows was back in the age of Windows XP. The fact that the Mac has a TON is problems is a sign that OS X is a major fail. Ted, I agree with you! True. I don’t like windows but honestly mac is getting worse in recent years. I got mine in 2015. I used some windows and quite a bit linux before that. I gave up windows completely now and use linux almost exclusively. Not only it is free. It is most robust. I need to dig up something back from my mac today after a year not using it. Just found that I spent a whole morning just to get it out of this black screen. I don’t know how one can defend this in 2017. It is ridiculous. Often, I simply change the Screen Saver & Energy Saver settings and for good measure, Reboot. That causes their previous (maybe defective) settings to be overwritten. I tried holding down Command and R at start-up which took me to Utilities window. After clicking on Disk Utility, Hard drive and then First Aid, all worked fine! HOW on earth do you do that if you CANT SEE THE SCREEN? This happened to my sister in law. I pulled the bottom cover, disconnected the battery for 15 sec. Then I reset the SMC. Her macbook was back to life. just one thing, why do you keep calling it the “Option” key ? Unless in the US Mac’s have the Option key, it’s not the same for every where else, it’s called the “Alt” key. Not every Mac user understands that the Alt key use to be the Option key. Why Apple did this is anyone’s guess ? So please either use Alt or at least mention both. Because mine says option and if you said Alt, I wouldn’t have known you mean option. It Just happened to me, but I haven’t updated my OSX yet. Note: the first attempt didn’t worked, I had to repeat the procedure twice. Install a VNC client on your mobile device. Log into your Mac. The screen usually comes back. If it doesn’t, reboot gracefully from the VNC session. It checks the file system, mounts the drive, removes a preference file, removes an upgrade cache file, then reboots. My iMac was doing this from both wake and start up and there is another solution under Fixing Black screen on iMac start up. I tried everything else but only this one worked. This sometimes happens on a Mac Pro if you’re using a 3rd party USB 3.0 PCIe card. It’s the manufactures driver (according to the manufacturer). Plus every port has something connected to it and that can cause the problem too. (What a cable nightmare). I never put my Mac Pros to sleep. I bump up the speed of all the fans when I step away and shut down most nights (other nights are for maintenance). I’d like to save money on my electric bill and not overuse components, but I don’t like turning these machines on and off everyday. Thanks. You’re a genius!!! For me, this problem started after I did a Mac OS Sierra update. Checked all the obvious & still didn’t work. Then, did what you suggested & now problem is resolved. Thanks again. I have a 2016 MBP and occasionally have this issue and have tried all of the usual suspects. Yet it still seems to be intermittent. This is also one of the reasons I purchased an extended warranty. My hope is that this gets settled sooner rather than later.. The simplest way I have found on my late 2009 iMac iCore5 running the latest MacOS software is to just type in the password. You won’t see the password box as you type, but when you hit “enter,” the screen becomes visible. I too leave my computer running, until it dies because I forgot to plug it back in! 2. SSH this is beyond me. 3. VNC is also beyond me. Anything else, anybody might suggest? You will only see the black screen as you type, no box to fill in, but when you press “Enter,” it will come back to life. I tried a lot of things to wake mine up, but realized that typing in the password was so obvious, I was overlooking it. After any period of inactivity, the length of which you can set, a password is required to reactivate a Mac. I had this problem today on my 2011 iMac 27 I7. Suddenly started blacking out the screen on a regular basis. I’m currently running the latest version of Sierra. I first reset the power save options to default just in case one was corrupted and causing issues making the computer go to sleep on a very short timescale. No joy. I rebooted, turned off and restarted, etc. no joy. I also noticed that my NAS drive was regularly saying that folders were not available in Lightroom. The machine is used for Lightroom and Photoshop as I am a photographer, so like all I7 Mac’s of that age, it does run very hot when processing this type of stuff. I thought it was overheating, so turned it off. Let it cool for 1/2 hour whilst I had some lunch and restarted. Same problem within a couple of minutes. LR kept telling me the folder (on the NAS) was not available and the screen would regularly go black, every few minutes. If I got 5 mins use before the black screen, I was doing well! Then I had to repeatedly press the power button to wake it up again. Both keyboard and mouse were being ignored for wakeup and the power button often had to be clicked 3+ times before it woke the screen up. I then started looking at other things running. Things that automatically started at login. MacUpdate Desktop, Spyder Utility (my screen calibration utility) and iStat Menus were the only other apps. I quit MacUpdate Desktop and hey presto, problem solved. I’ve since sent it to the trash as I only had the trial version anyway! Hey guys, It might have happen that none of the above-mentioned 5 methods delivered you from the black screen of death (trust me, I tried for days)… But there’s hope! What worked for me was holding the Option + N keys when restarting. That starts up from a NetBoot server using the default boot image. Would be interested if it helped any of you. Good luck! Rebooting not an option – it won’t wake up to reboot. Will Reder SMC and PRAM once it’s back up but I’m this close to taking off cover and pulling battery. Grrr…. have a TON of work to do!!! But as I said, the guy from Apple found the solution for my macbook: He unplugged the display cable of the Macbook, then started it, and then did a PRAM reset. He finally reconnected the display and that was it! Am I the only one who thinks these guides are useless? None of the options have helped at all, and all these guides never work in my long history of mac computers. Hi Laurent I your solution worked for me, what’s thank you so much. My son cracked the screen on his macbook Pro, and I ordered a new top half and had the black screen issue and was nearing the point of giving up when I tried your solution. Thanks :) you saved me buying a new one. Command+Option+eject works for me – after a couple of months restarting my iMac every day because the main screen wouldn’t light up (second screen fine) and after trying SMC reset I figured I’d just give this a shot before doing anything more drastic. Press once makes second screen go black, press again they both come come back on. Hope it helps someone. OMG… been sat here turning it on and off.. and it was the screen brightness…. doh! I have a MacBook Pro- bought in 2014- I use my computer for work- and want to cry when this blank screen happens- the PRAM reset has always worked. This time it did not- I turned over computer to contemplated taking screws off…..but I said, wait this is a $1400 machine why do I have to be a computer mechanic on top of that price. In last minute desperation I did PRAM reset- this time I kept pressing the power button while holding, command+option+P+R not just waiting to hear the sound, I did this probably 12 times, then all of a sudden the tiny apple appeared, I was so thankful. ALSO thankful to all you who added to this comment section- it was so good to know I WAS NOT ALONE at 4am dealing with this issue. Thanks to people like you for free advice, as I have no money to fix this expensive computer I bought to help me work. IF you work at APPLE and are listening- PLEASE find a fix for this incessant problem. I do not know the name of the person who posted this solution but my “Serious Thanks” to them as it solved the problem. As other have posted my problem started after updating the OS on my 2012 Mac Pro. I did not piece-meal the solution but reset the SMC, the NVRAM, and the PRAM as instructed and now it works perfectly (step 3). I am feeling lucky to have my old MacBookPro that I could restart and have the black screen go away as I am looking for ways to revive my new MacBook Pro that was updated… or maybe it didn’t finish, I’m not sure, but I have tried all the tricks listed here (not all, I didn’t delve into the hardware), more than once, and nothing seems to be working. I dread driving into the city to go to the genius bar. Do any of you geniuses have anything else to try? Nothing appeared to work, but, like I said, I walked away from my computer with the power plug in and the power on and when I came back an hour later the screen with my name and guest was on. It worked for a while, I should have reinstalled MacOS. The screen blinked on and off and it also “rained” red and green pixels for a while. Today it isn’t working. None of the methods helped except Coolidge one. typed the lines blindly while in single-user-mode and after reboot the screen lit up. Thanks!! I just tried evrything this article said. Nothing was working. I was down to reinstalling mac OS but I couldnt even see the recovery screen. i managed to hook my MBP to a monitor and I could see the Apple logo progress bar getting stuck everytime I tried to turn on my laptop. I logged in safe mode presing shift after the Apple sound, thatwas the only way the progress bar wouldnt get stuck and I was now on the account log in screen where you select the user and enter the Password, except my monitor was acting as a second display, conecting a mouse and closing the laptop solved the problem. Once in recoverymode I tried the CleanMyMac solution above and uninstalling some unnecessary software but every time I restarted, my display would still be black with some backlit but nothing would appear, I could only interact with it through my secondary monitor. I tried to install the latest software update from the safe mode but once, took about 20 minutes and in one of the restarts the same thing happened, black freeking screen, only backlit, couldn’t a thing even in my secondary monitor. Well I was about to use my secondary monitor workaround to enter recovery mode and clean install high Sierra but before that I did one last thing… I forced shut down the computer and (I know it sounds stupid) I just banged my MBP, just a little, a hard slap here and there and a forceful shake, turned it on again and there it was, the Apple logo appeared, the progress bar said that the update had 15 minutes left to complete; I waited and that was it, I am here writing my experience. Just sharing in case it helps, I wasted about 3 hours with this. Good luck guys. I tried everything on the list and in this article. The only thing that worked was the suggestion by Coolidge (run a string of commands). Just wanted to comment and say thanks! And also give frustrated Mac owners hope that your dim screen will brighten once again! I love you, you’re a life saver for this article. Step 3 worked perfectly. Immediately backed up all important files after this. Julian, Thank You! I tried as many of the options as I could (not very tech savvy) and yours is the only one that worked. I pushed Option (alt) + N as soon as I pressed the power button and Voila! I have MacBook Pro (13-inch, 2016, Four Thunderbolt 3 Ports) purchased in early February 2017. After multiple failures to wake which was at the end not helped by NVRAM or SMC resets I took the computer to my local Apple Store. They were unable to get the computer to function and they accepted it for repair under warranty. When I got it back they had replaced the main board, the battery and the display; basically everything. The computer came back with MacOS 10.12.6 installed. Before I reinstalled ANY of my software the computer began to show Sleep Wake Failure. I now have turned off sleep and that is how I will continue to operate so that I can salvage some of my investment in this machine. My first Mac was a 128K Macintosh. This MacBook Pro will be my last Apple computer. As demonstrated by this support thread and my own experience, Apple has multiple software and hardware problems with its current generation Macs and it is clear that they are both unwilling and more importantly UNABLE to fix these problems. There is a little known glitch with the newer macbooks (perhaps some of the older ones too). If you shut the lid while you have an external display, and then unplug your computer from that display and go about your day, the next time you open the screen it will be BLACK. The computer is on and responding as evidenced by the touch-bar changing with key strokes/shortcuts. The only solution to this issue is either a hard reboot by holding the power button down, or by reconnecting the external display that was connected before you closed the lid. If you reconnect the displays, the built in retina display will come back to life. I havent tried connecting a different display because I usually run into this issue in a meeting or somewhere else terribly inconvenient. I’ve learned this lesson the hard way a few times over now. The second steps helped me to solve my problem. Thanks for the solution.